This substantial property offers space, quality, style and value! In the heart of wonderful Eastbourne, it is close to the beach, shops, schools and cafes - no need to reach for the car keys! 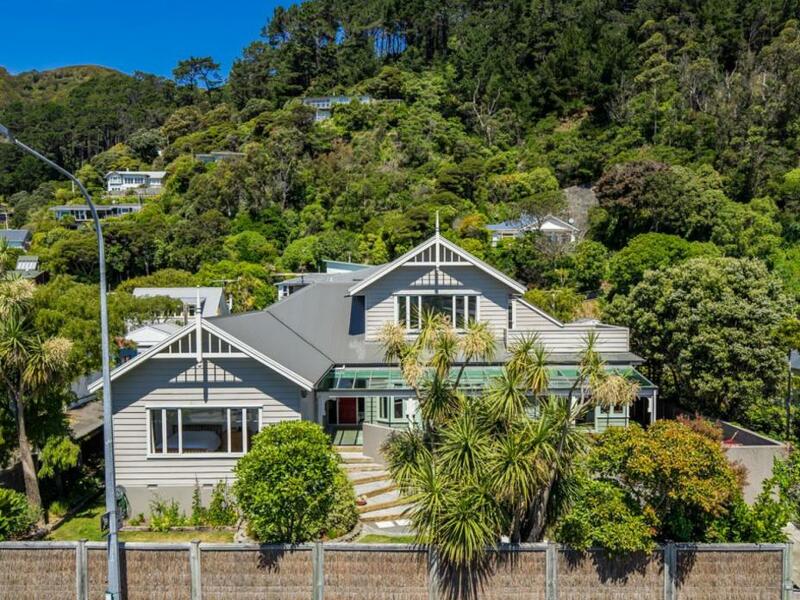 And a sociable, 20 minute ferry to Wellington's CBD is just a stroll away. Your family will be part of a vibrant, close knit community and, yes, this is paradise. Extensively refurbished, this home exudes a warm, gentle charm with its blend of character and modern. High studs, central heating, double glazing, bespoke timber detailing and a neutral decor add up to a very soothing home. The living is spacious and extends via bi-folding doors to a large, immaculate deck. The fully fenced 809m2 section is perfect for pets, play time, the trampoline and enjoying the sunny outdoors all day long, year round. Of the four ground floor bedrooms, two are ensuite. Upstairs, the master commands its own floor with a shower room, walk-in-wardrobe, private deck (the perfect sunset spot) and lovely views to the hills and sea. And there is a bonus two bedroom self-contained flat too. Use it as an income stream or save it for your lucky guests. You will hardly know they are there! After 12 happy years the owners are reluctantly leaving the home they love, to pursue new dreams down south. They leave it in pristine condition for your family to simply move in and enjoy. Few homes offer so much so call me today to view and make it your own. A private paradise awaits behind the brush fence. A landscaped garden and sweeping steps lead to the front door, crafted from Rimu with bespoke lead light surrounds. 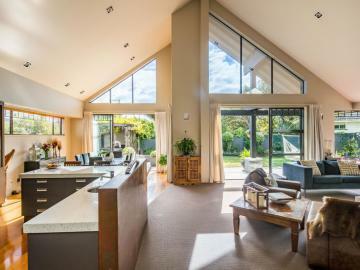 A wide hallway with polished Matai floor takes you past the downstairs bedroom wing and into the heart of this beautiful home. The open plan kitchen extends to accommodate dining and informal family living. Bi-folding doors open to the covered front deck - a favoured spot on sunny afternoons. The master bedroom suite is accessed via a staircase from this wonderfully inviting hub. The clean white lines of the open plan kitchen are a perfect continuation of the neutral decor throughout the property. The design allows for plenty of helpers to lighten the cooking load. The outlook is to Eastbourne's beautiful beech tree clad hills. Direct access to the rear courtyard. 1. On its own floor and accessed from the Family Room, everything about this large and private suite says "Relax". Added as part of the 2009 renovation, the scale and high stud are in harmony with the rest of the home. Enormous double glazed windows offer sea views, reminding of your close connection to the beach and harbour. The private deck is one of the many spots to enjoy a glass of wine and spectacular sunsets. Walk-in wardrobe, linen cupboard and ensuite shower room complete the suite. 2. Four of the five double bedrooms in the main part of the house are located within a wing off the hallway. A further inner hallway creates privacy. Two shower rooms are also within this space. All enjoy masses of natural light, fitted wardrobes and central heating vents. All are carpeted for additional comfort and are individualised by decor and window dressings. The west facing room, to the front of the house is the largest of these rooms, with a walk-in wardrobe and ensuite shower room. 1. The 4 bathrooms in the main part of the house comprise two ensuite shower rooms, a family bathroom (including spa bath and separate guest toilet), and the master ensuite. The separate laundry and utility rooms are to the rear of the house, with easy access to the washing line. Plenty of room for the entire family to hang coats and store shoes, plus excellent storage space. Or a sixth bedroom should it be required, A spacious room with large cupboard/double wardrobe located separately from the ground floor sleeping wing. The two bedroom flat is discreetly positioned up its own stairs and is accessed from one of the back doors or through a fire door in the laundry. While the flat is part of the house each enjoys privacy from the other. With two double bedrooms, a separate kitchen and living room this is a great spot for either hosting guests while retaining privacy or as a fabulous Air B&B option. 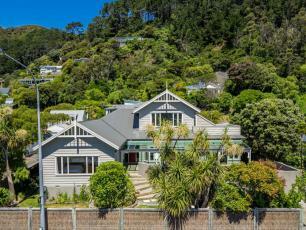 It even has a deck with a view to the beautiful Eastbourne hills. In keeping with the rest of this immaculately presented home, the sunny, flat 809sqm section offers fabulous outdoor living. There are plenty of choices to suit the weather conditions, the occasion and your mood. These include a large, curved, part covered deck off the two living rooms, a front lawn (great spot for the trampoline) and a fabulous rear courtyard. You'll find perfect spots for privacy, family fun, entertaining or simply relaxing in the sun. Additionally the master suite and flat each have their own private decks. Along a lane where you enjoy right of way, the internal access garage is discreetly located to the rear of the property. As with the rest of this home, the garage is large with natural light. Plenty of space for two cars and workshop area. Shelving eases the storage of kayaks, bikes and other sports gear. This home offers the kind of storage of which dreams are made. A bank of floor to ceiling cupboards are tastefully incorporated into the hallway, loft access is gained via the master bedroom's walk-in-wardrobe and there are excellent standard sized cupboards throughout the home and flat.